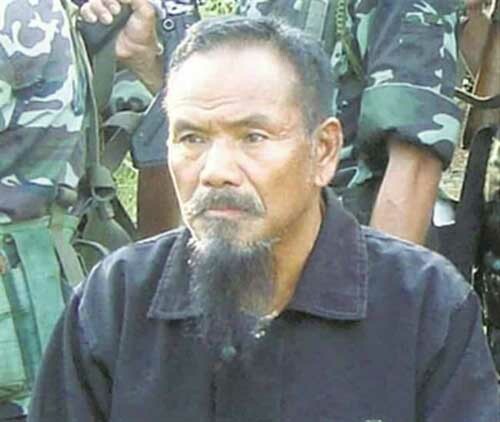 The NSCN (K) group has ousted its chairman Khango Konyak and replaced him with the nephew of the late SS Khaplang. 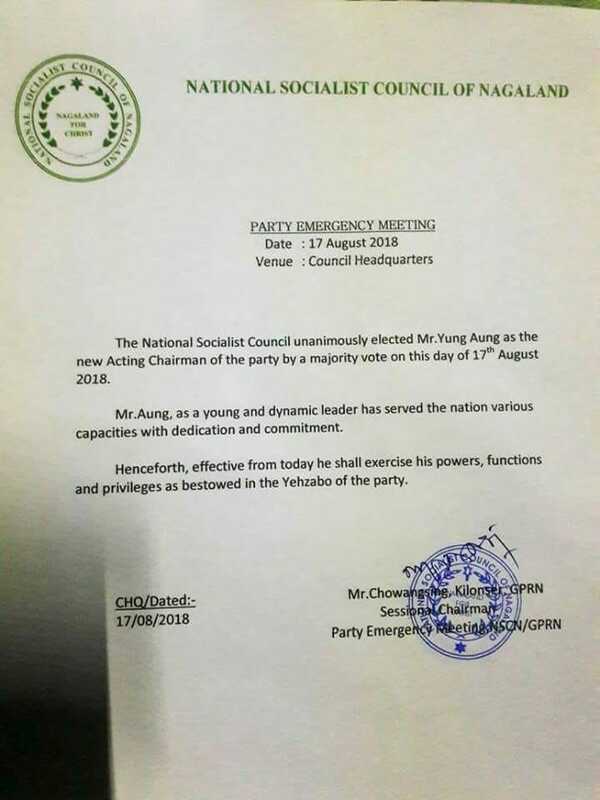 In an emergency meeting on Friday in the rebel headquarters deep inside Myanmar’s Sagaing region, the group ‘unanimously impeached ‘ Khango, blaming him for ‘violation of party discipline.’ Yung Aung has replaced him as the group’s chairman. “In compliance with the Article 27 of Part-III of the Yehzabo, the People’s Council by a majority vote hereby impeach Lt.Gen.Retd.Khango, Chairman NSCN from his Office for violation of the Party Yehzabo and discipline,” a press statement from the NSCN (K) said. # Absolute control of powers & functions without Collective leadership, Non- distribution of powers & Functions exposing a one-man-government policy which is completely in violation of the Party Yehzabo and discipline. # Incompatible traits which is against Article ‘9’ of Section ‘A’. # Conduct of affairs independently which is against Article ‘4’ of Section ‘C. But the statement said Khango will be allowed to leave unharmed and allowed safe passage” in recognition to his long service towards the cause of the nation. It was not clear why the safe passage but those familiar with the power struggle within the group say it was meant to allow Khango and his close lieutenants to leave Myanmar and head out towards India ‘s Naga areas where Khango belongs to . It is also reliably learnt from intelligence sources that dreaded K group military commander Niki Sumi and its publicity secretary Isac Sumi have left the group’s council headquarters with Khango. But there is no independent confirmation of it. Khango , a China trained rebel, took over as chairman of the NSCN (K) group when legendary Hemi Naga rebel leader S S Khaplang died last year after long illness in an Yangon hospital due to d age complications. Khaplang’s nephew Yung Aung,45, has now been appointed ‘Acting Chairman’ of the group with immediate effect . Aung studied in Manipur and is a martial arts and polo expert. His taking over the group’s leadership marks the ascendancy of the Hemi Nagas in the rebel outfit. How that will impact on the group’s ongoing parleys with the Myanmar government and whether that may lead to a reworking of priorities on continued hostility with Indian forces remains to be seen. There has been some speculations belatedly that the Burmese Nagas in the K group were no more interested in fighting Indian forces and would prefer to get Indian backing for a honourable settlement in Myanmar by extension of the Naga self administered zone in Sagaing and inclusion of more townships in it as well as gain more autonomy for this region. That does not fit into the scheme of things as far as the Indian Nagas are concerned who are more keen to get a slice of the cake when India signs a final settlement on the Naga issue. Presently negotiation for that has been going on with the NSCN Muivah group since 1997. Delhi had a ceasefire going with the Khaplang group until the Burmese rebel leader unilaterally abrogated it in 2015 and resumed hostilities with India, presumably because Delhi did not appear keen to involve his group in negotiations. It is also to be seen whether Yung Aung will continue to allow other northeast Indian rebels like ULFA to continue use the Sagaing base area or ask them to pack up and leave. The Kachin Independence Army or KIA did that in 1989 after a deal with Indian intelligence but now the K group may weigh the benefit of Indian backing for an autonomy deal in Myanmar and for substantial Indian funding for development in the Naga self administered zone in Sagaing.